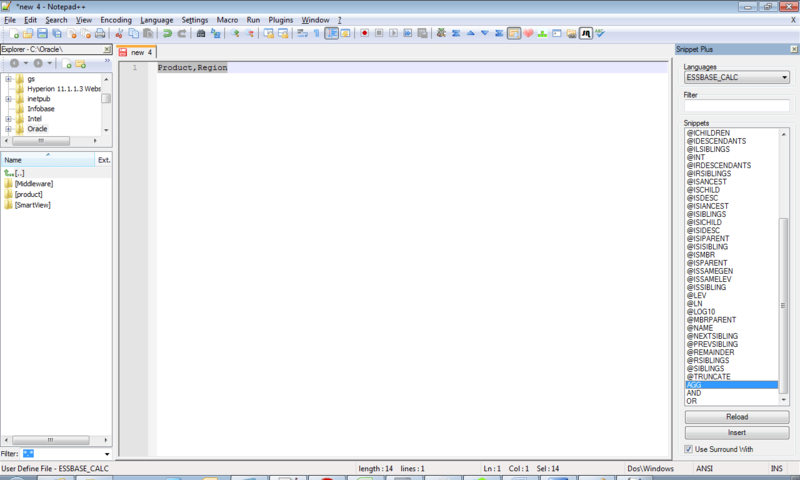 When I posted about the highlighting option in Notepad++ I got a comment which took me to Essbase Labs. The post describes about Textpad highlighting, this one (Textpad) has another feature in which all the Calc commands, Maxl statements, MDX syntax is shown in a clip library. It is a pretty good option (but I don’t want to give $27 for that), so I thought of getting a similar feature in Notepad++. Only option was to Google, and found that clip library is also known as snippets, I just remembered that I’ve seen it in Notepad++, if you go to Plugin Manager there is a plugin called SnippetPlus (this was the one which I was looking for). So I’ve created the entire Essbase Calculation commands, Maxl and MDX into the snippet format. 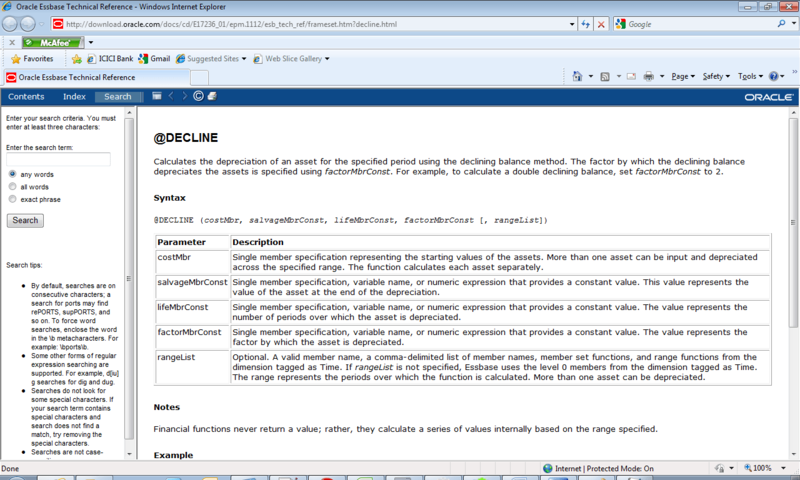 Select ESSBASE_CALC from the Snippet Plus languages. That’s it you can now carry all the functions without having Essbase or EAS. I’ve added DATAEXPORT, RETURN and some SET options which will not show up in EAS!!!!. I had to remove the Mathematical operators (like * – + / %) and Boolean ones (>= <= == <> !=) they were giving me alignment issues, somewhere coming at the top and some after @functions (I probably think it’s because of &lt; and &gt; tags that I used). 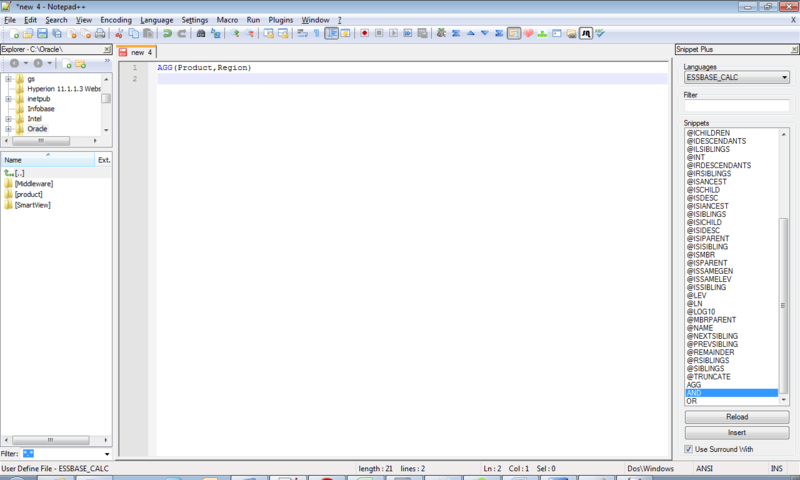 Now check Use Surround with (right corner radio box) and select ESSBASE_CALC and double click on AGG, now Magic begins. After adding SnippetPlus plugin, there will be a file called SnippetPlus.xml, in Notepad++ config folder (pluginsconfig). Replace that one with the one you downloaded. 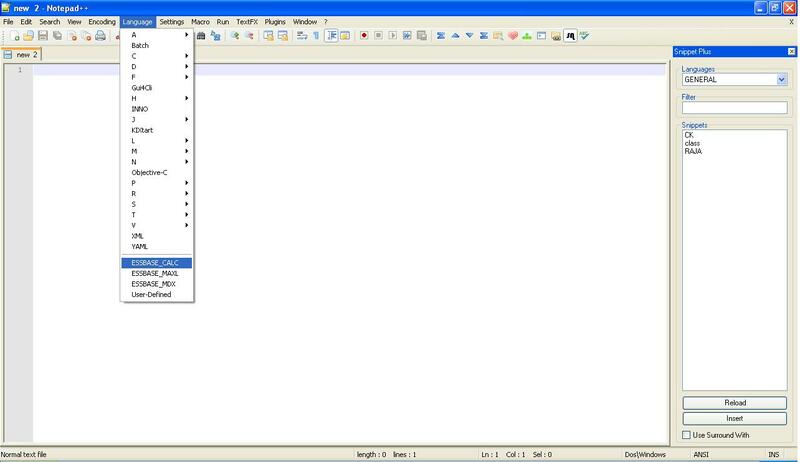 Restart Notepad++. “Use Surround With” to use surround with functions. I would like to thank Rajesh Kumar who is the Author of SnippetPlus and Chris Covier from NotePad++ team for their unextended support. P.S. There is a limitation where if you select a user-defined language sinppetplus will not change automatically (this is because all the user-defined language in Notepad++ is internally referred as USER). 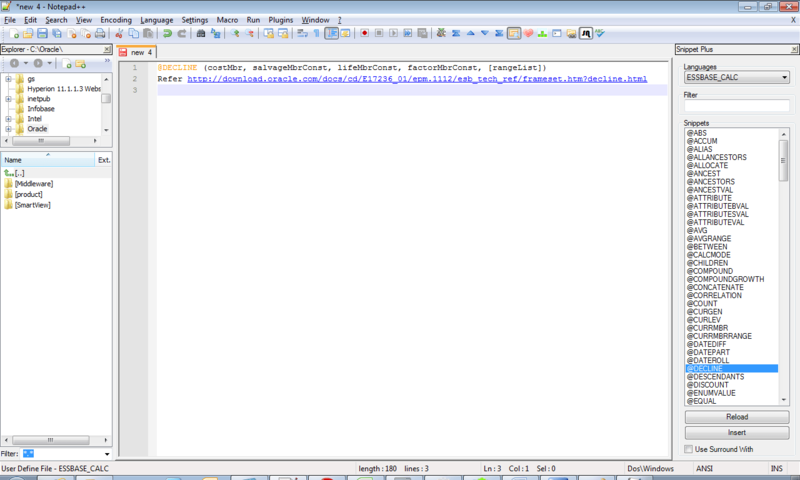 I don't seem to see the Config folder under Notepad++ home to place this XML.?? you'll have to use unicode version of Notepad++, launch notepad++.exe, go to Pulgins–>Plugin Manager and install SnippetPlus. This will create the config folder. this works like a charm!.. very much useful. many thanks Mate! do we have FIX, IF, IFF,etc? i don't see them, do we need to put that back in XML?, i can research from here. You can uncheck the radio button on Use Surround With and it'll open up the syntax for all Calc, Maxl, Mdx commands. yes you have to replace the existing snippetplus xml file with this one. U rock man…! God bless you…. Did you use Snippet V 1.3? Any other suggestions please? Please download the zip file instead of the exe. I figured out the root cause of Sri's issue. When you install Notepad++, you can choose whether the Config folder is saved within the Notepad++ folder (i.e. "Roaming" option, which allows you to store Notepad++ on a flash drive), or instead whether you want it to be saved in %APPDATA%Notepad++. If you chose the latter, you need to go to "Run" | "%APPDATA%Notepad++" | "Plugins" | "Config" and save the SnippetPlus.XML file in that folder. This will be very helpful CV, thank you! Oh I forgot about that one…good catch there "The DH"
There are installation instructions in the readme numbered 1 to 3… lesson 1 – read them! CV, What xml files do I need for the Essbase CMD, MAXL etc to show up in the Snippet pane?? Hi CV, Thank you for the prompt response. I got SnippetPlus installed and also have EssbaseCalc as the language under Language pull down. How do I get EssbaseCalc as selectable language now in Snippetplus? Do I need to copy code from EssbaseCalc xml file to Snippetplus xml file? Hi CV, yes, I have the SnippetPlus window docked and Use Surround with unchecked. Now I see other languages in the SnippetPlus drop down, but not EssbaseCalc, MXL and MDX…..I will have to add those in SnippetPlus xml file manually, correct? Hi PJ, did you download the file that is given in this blog? that one has all the commands. This link for downloading the Essbase snippet from (here) seems to have expired. Any chance I can get this file from other location or if possible you can refresh this link. @anon, it works fine. Maybe there is a firewall which is blocking you from accessing the link.